Sitting here in my office on a dull, dreary day, gazing out of the window across the local park, my mind wanders back to a delightful walk that I took recently. 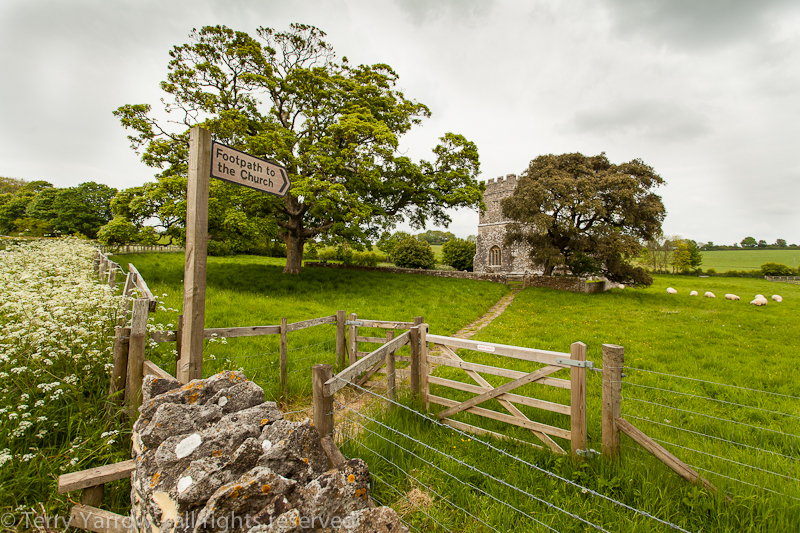 It was in many ways a literary walk taking in some wonderful Dorset countryside and several wonderful old Dorset churches. It was a walk to inspire the imagination! Join with me and we will walk together. It started in a delightful area of woodland, made all the more special by the dappled light and amazingly fresh spring colours in the trees. Verdant new life that just takes your breath away! As I walked along the track that wound its way through the woodlands accompanied by the bird song all around, I could not help but think of Thomas Hardy’s Tess. 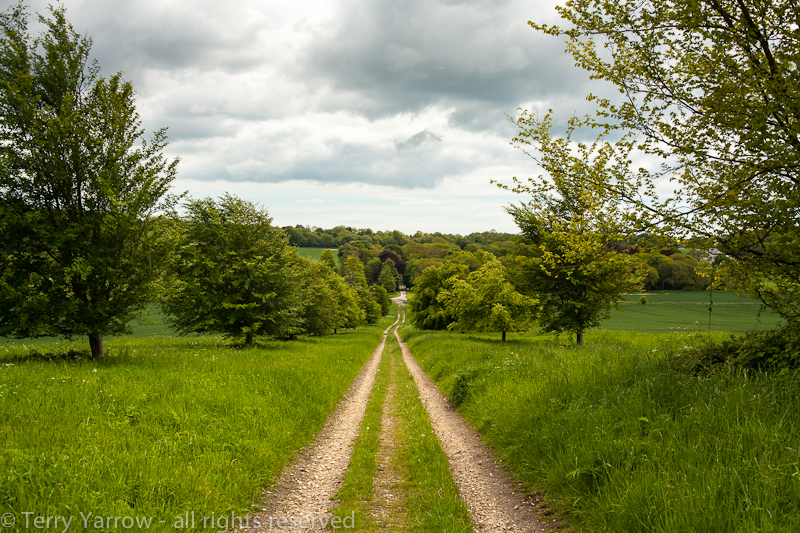 I could picture her walking these ancient tracks with her friends as they made their way to church in their Sunday best dresses with Angel Clare not too far away. It was sad that the event that led to her demise came in a similar glade at the hands of Alec d’Urberville! Thomas Hardy wrote of such tragedy that seems to contradict the joy of this location. 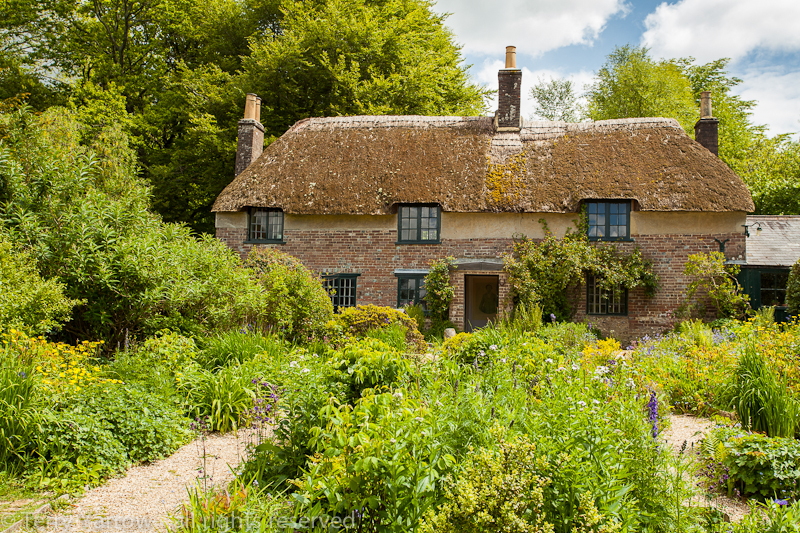 With these typical Hardy woodlands and the nearby open heathland that once covered the whole of Dorset, it is not surprising that his novels come to mind because sandwiched betwixt wood and heath stands Hardy’s Cottage. Built by his great grandfather, this is where Hardy was born in 1840 and where he started his writing career so it is fitting that he wrote of the area that surrounded him. The cottage, now delightfully preserved by The National Trust, could have easily jumped out of one of his novels. Looking across the garden, you can just hear Gabriel Oak’s voice drifting out of the open window saying to Bathsheba, ‘And at home by the fire, whenever you look up there I shall be – and whenever I look up, there will be you’. 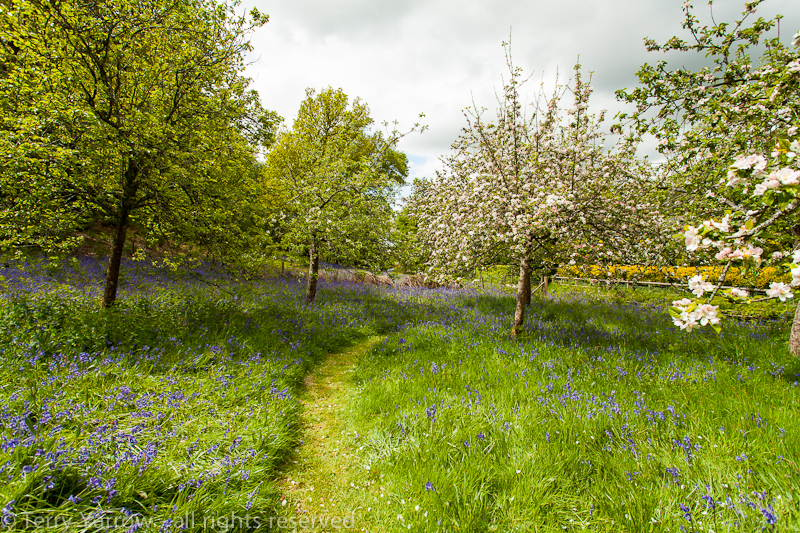 Passing on down the narrow lane that seems little changed since Hardy’s day, I passed the first of several orchards, beautifully adorned with blossom and bluebells. It would have been a great place to ‘stand and stare’ awhile…….but there was a walk to complete :)! Not that I got very far because just down the lane I came across a very friendly lamb who needed a bit of fuss! So I obliged :)! 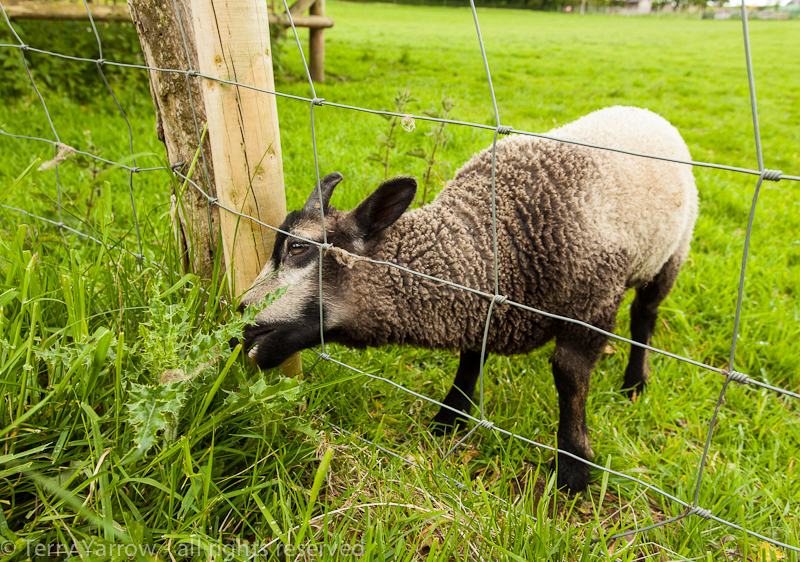 Well, it is unusual to find a lamb who comes towards you rather than running away. In fact it was one unusual sight to another because I hadn’t gone half a mile further before I saw the nest box below. 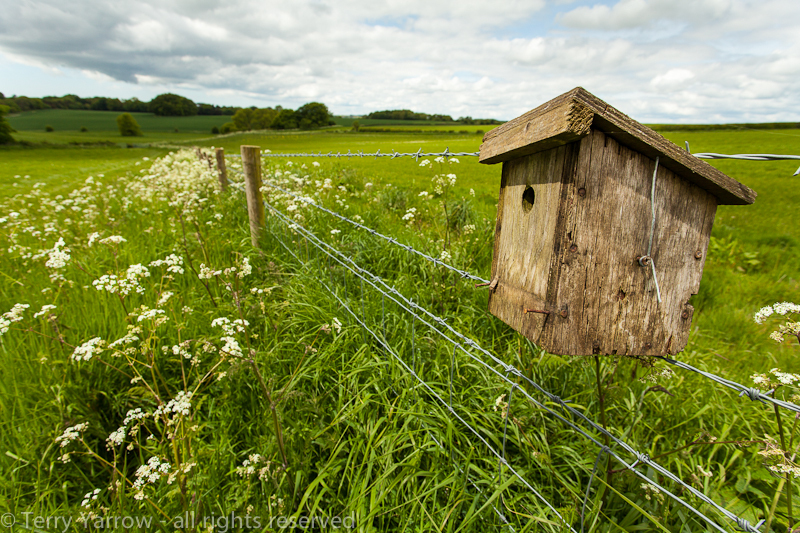 It seemed a somewhat random place to hang a nest box. Needless to say, it was empty. 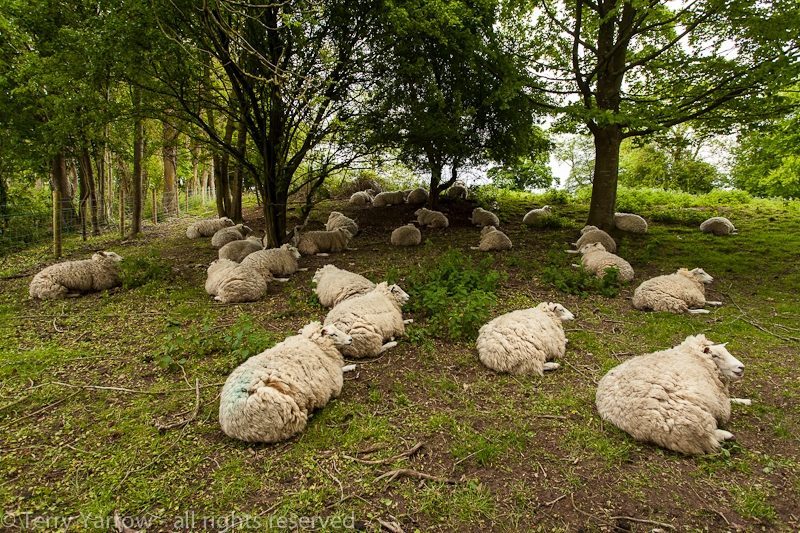 But there was more to come because just a little further along the track I passed the sheep below – for some reason all clustered together under a small clump of trees despite having a whole field of lush grass! I wondered if they knew something I didn’t :)! All along this walk you can see the ‘Hardy factor’. 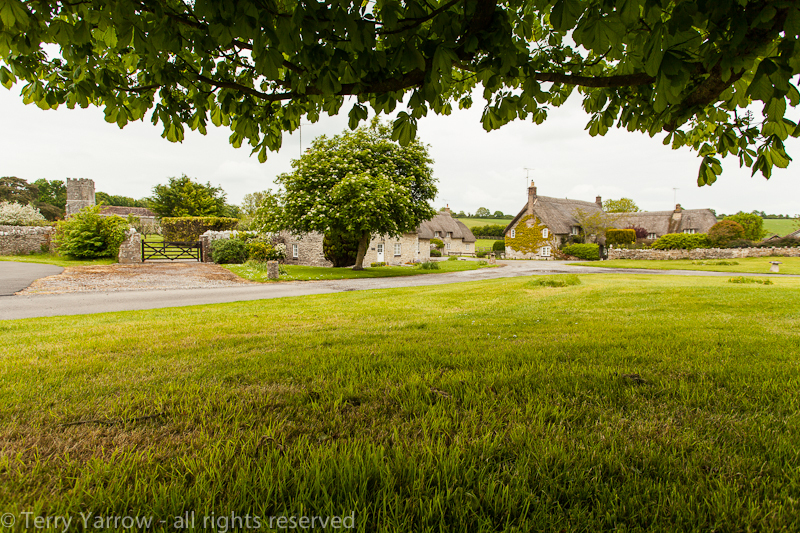 Passing through a tiny village I passed thatched cottages along either side of the narrow country lane, including the old school house and the old post office. These would have been two thriving gathering points in this small community in Hardy’s day but no longer. As with a lot of villages, these ‘centres’ are no more as they have been converted to private houses. 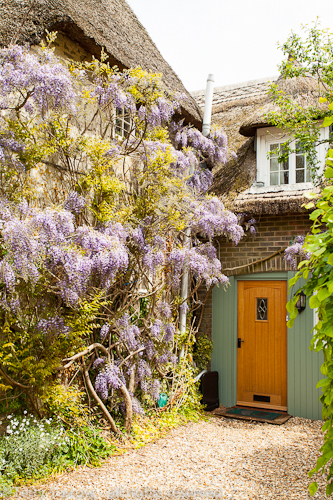 This was a spring walk and that was very evident too in this village with one of my favourite plants, the wisteria, growing over some cottages. Passing on through the village, my route took me over a lovely old bridge which had the usual warning notice about transportation if anyone caused damage to it – these are often seen in Dorset although it seems a harsh penalty – and onto a delightful causeway between two streams. 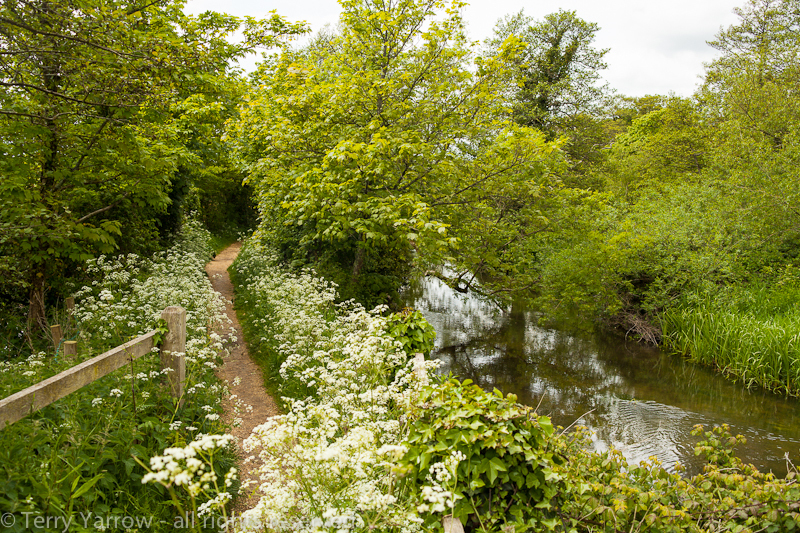 This really was a lovely part of the walk with the rippling stream on either side and a spectacular display of beautifully delicate cow parsley, not to mention a swan with a family of tiny cygnets. 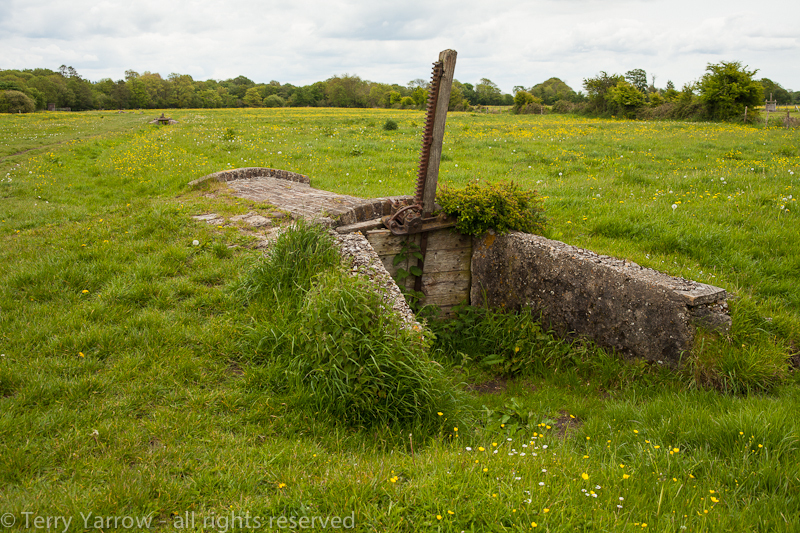 This was such a varied walk as the river led on to some lovely water meadows, rife with buttercups and with many relics from the past, including the old sluice gates and channels that would have been used to flood the meadows in spring. This was the method used to raise the ground temperature ready for the planting of seeds to ensure a speedy germination. Although derelict, these sluice gates are still in place, part of the heritage of past generations. I often wonder what life was really like back in those days – I would love to visit but I fancy I would want to come back to this century! Fortunately the weather has been drier so the meadows were easy walking. Before long, I found myself passing Hardy’s other home, Max Gate, currently shrouded in scaffolding as the National Trust carry out renovations. From here, my route took me down a lovely track that Hardy must have walked many times when visiting his friend and fellow author William Barnes. They were near neighbours when Barnes was resident at the Came Rectory. And of course this part of the walk would not be complete without a short detour to take in the old church where William Barnes was rector. Standing in this church, you could just imagine Barnes preaching from the pulpit. He must have had a broad Dorset accent as he wrote in the same dialect – not easy to read even for a Dorset born and bred man like myself. 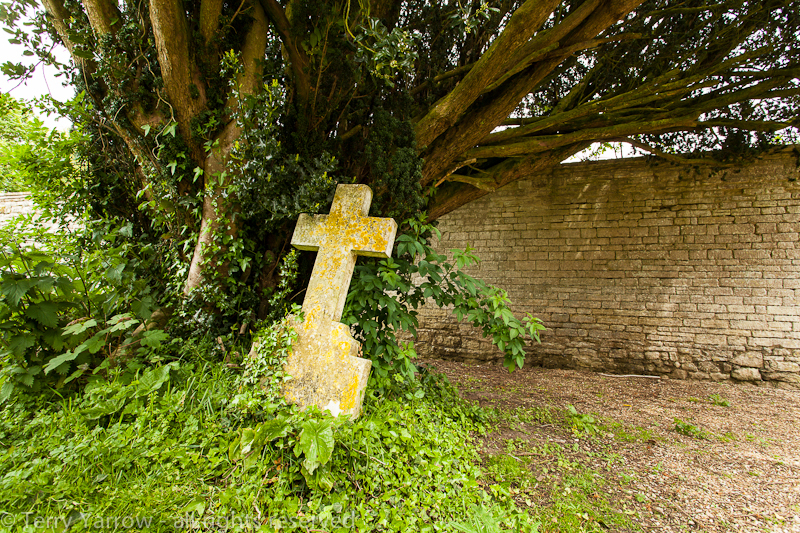 And in the churchyard, another literary giant comes to mind – Thomas Gray in his Elegy Written in a Country Churchyard wrote, ‘Beneath those rugged elms, that yew tree’s shade……..Each in his narrow cell forever laid’. Such a great descriptive poem, and death is so final……..or is it? 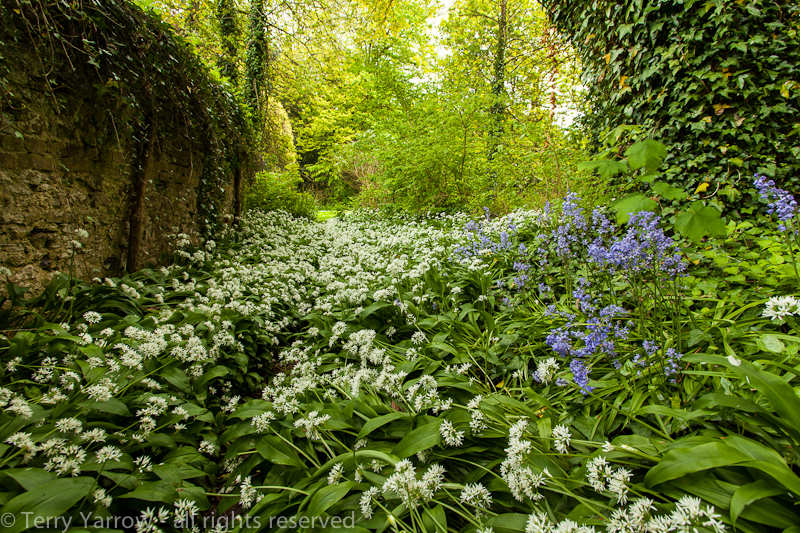 And almost right outside the church was the loveliest display of ramsons and bluebells. A fitting tribute to a famous Dorset author. It seems that I am forever passing strange sights…..or maybe it is just that I am always on the lookout for quirky and unusual things. The picture below is no exception :)! 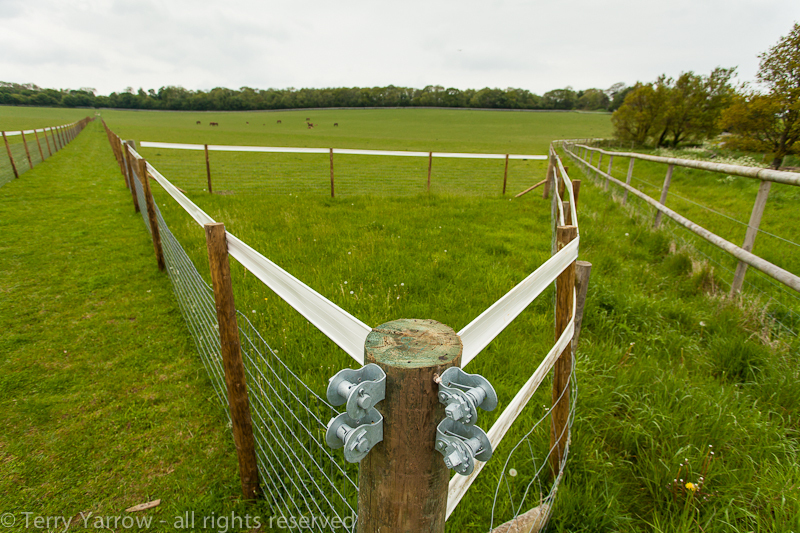 This is something I have seen a number of times before where the corner of the field containing horses is essentially blocked off. I can only surmise that it is because horses fight if trapped in a corner so any potential areas are blocked off but I don’t know if that is the case. 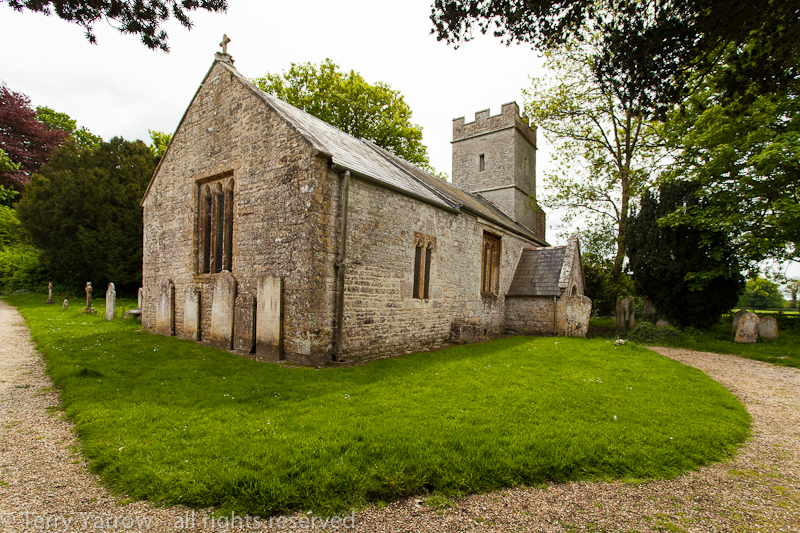 Having walked cross country for a time, I reached civilisation again when I came to a lovely unspoilt hamlet with just a cluster of cottages, a tithe barn, a manor house, and a delightful little church. This is of course the make up of many Dorset hamlets. The church, dating from the 12th century and of unknown dedication, is set apart from the hamlet in the middle of a field. It really is a beautiful sight and is another church being cared for by the Churches Conservation Trust who do a great work. The scene below is just so typically English, but the sign always makes me smile – it seems to be somewhat stating the obvious :)! 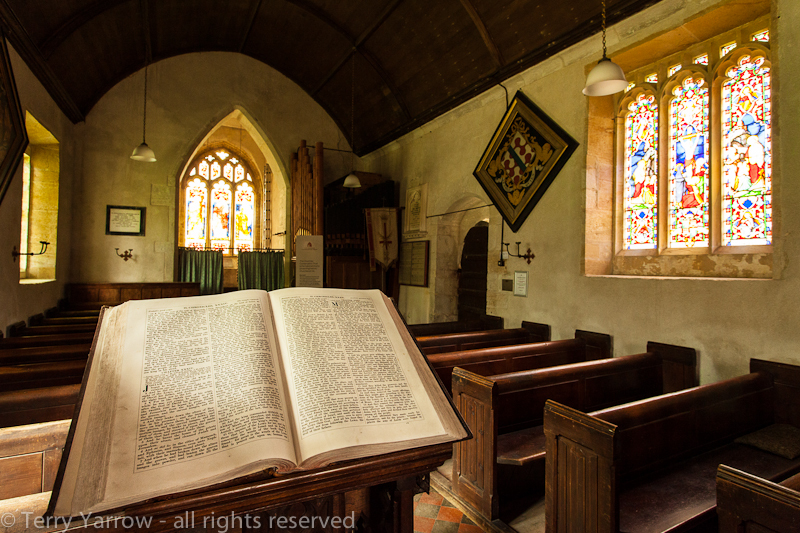 Even here there are literary connections as it was in this little church that William Barnes preached his first and last sermon. For me, the peaceful churchyard made a great place for lunch in the company of birds and sheep. Having had my late lunch in the churchyard, it was time to press on along country footpaths, accompanied by skylarks singing their sweet lilting songs overhead – isn’t it amazing that they can make such glorious music whilst flying (it must be like us trying to run and sing at the same time). Such a lovely sound that just lifts any stresses away and takes you into another place. The sound is so joyful you feel that they belong in church. And it wasn’t long before I came across the next church on this walk. 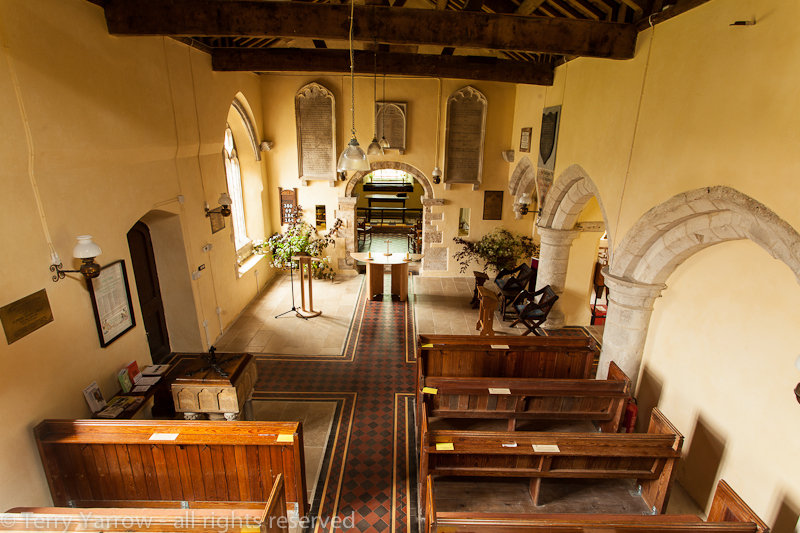 Another lovely unspoilt village with a very old church that had been modernised inside to create a lovely light, airy worship space – a real ‘ancient and modern’. My route after leaving the village took me across farm land and quiet country lanes with verges that were breaking out with a myriad of different spring flowers, eventually crossing a railway line. 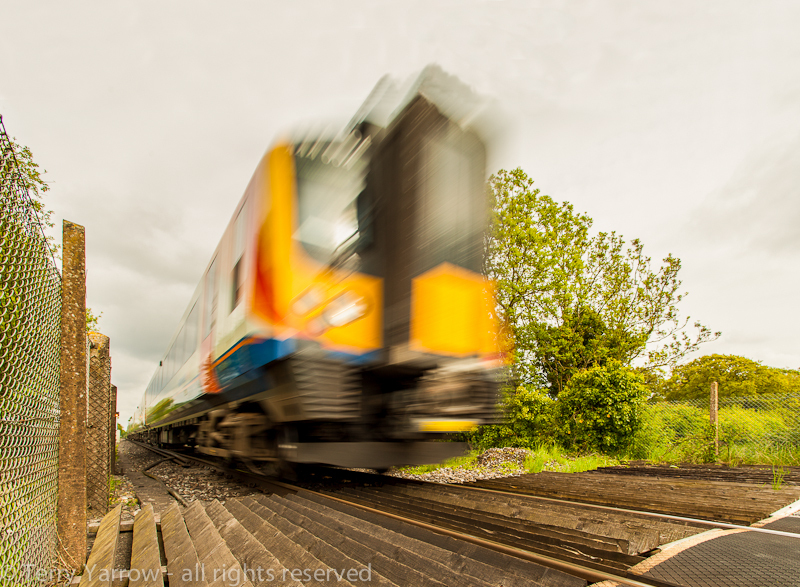 Here I thought I’d try something different so I crouched down in the gateway and waited for a train to come along, which it did very soon……..and very quickly too! In fact as it passed, the air pressure created almost knocked me over :)! Well, it had to be done :)! 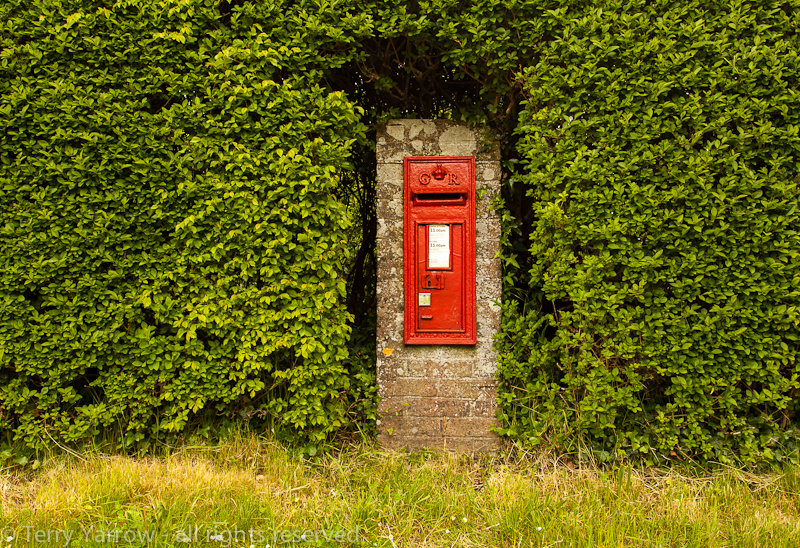 I was nearing the end of the walk now but there were still more interesting things to see, such as the old King George post box buried in the hedge below. 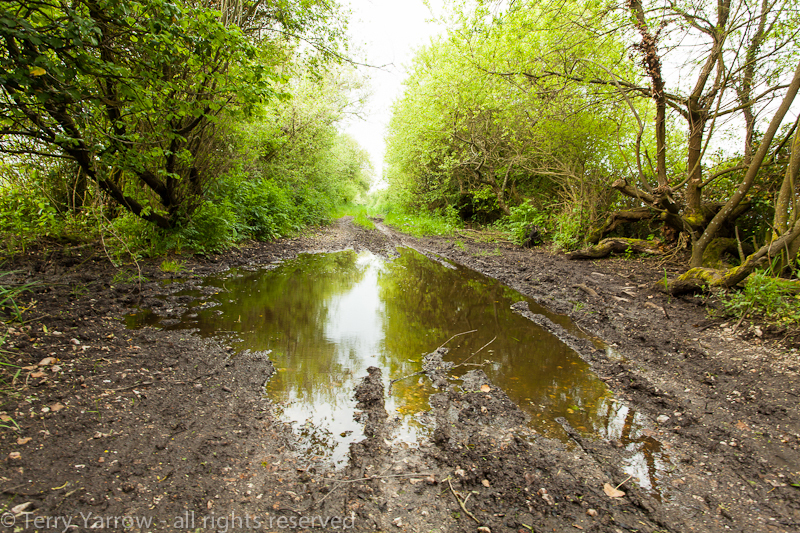 And as I approached the end of my walk, Thomas Hardy returned as I negotiated a particularly muddy section of the track. It brought to mind the scene from Tess of the d’Urbervilles where Angel Clare carries Tess and all her friends one by one over the mud so that they didn’t get their clothes dirty. What a gentleman!!! 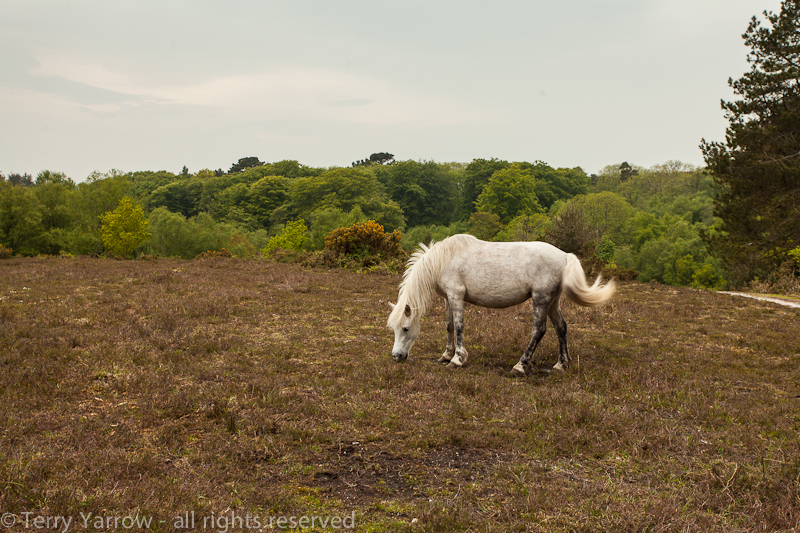 And yet another scene came as the forecasted rain began to fall – I’m sure that is Joseph Poorgrass’ horse wandering free on the heath. He’s probably at the inn again! 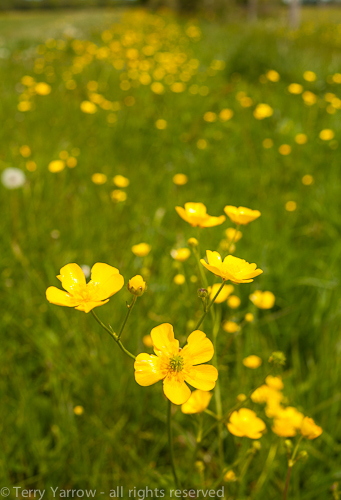 Before we finish, let me take you back to a meadow near the end of the walk – what a lovely relaxing sound. What a great walk! So much to see and hear, and so many connections with our literary giants. I hope you enjoyed walking with me. Previous Of empirically English seaside sights and sounds! Terry, I was so delighted to see another post by you! They are so few and far between these days. I was actually working on getting me some breakfast — and getting a couple of pills down with food — and while I waited for toast, I decided to just pop onto WordPress and see what was going on today. When I saw your post, I stopped everything else and just read. Couldn’t seem to wait until after breakfast. This was wonderful, as usual. In fact, I think they’re getting even better all the time. Really wish I could visit that area a while. I know it probably has a lot of negatives like the rest of the world, but looking at it through your eyes certainly makes it seem like a terrific place to live. Something that has always struck me as strange, though, is the reference to “cottages” in English literature. Here in the States, a cottage is generally a very small, perhaps one to three room house with no extras. But almost every time I’ve read English novels, the cottages they describe are quite large — two story — and have more space than a small house over here. Then I see your photos, and so many of those cottages seem to be large as well. 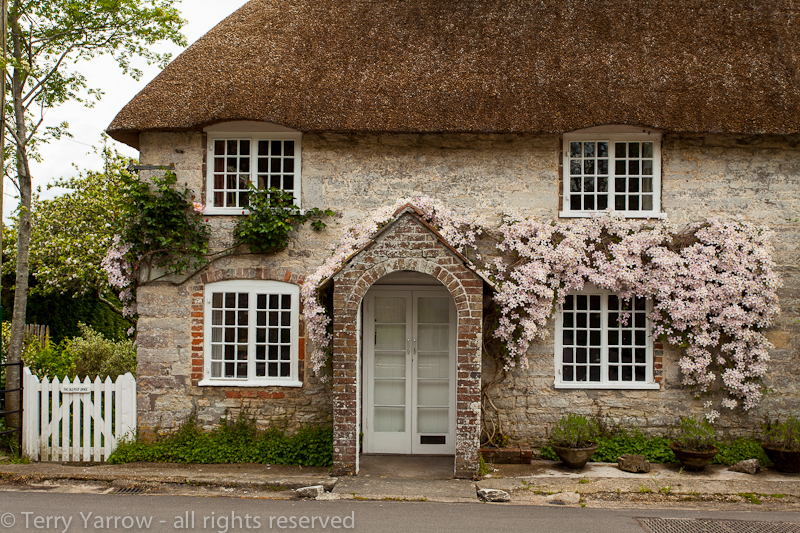 What does the term “cottage” actually mean in England? Thanks Sandra, you are very kind. I try to post as often as I can but it takes quite a long time to prepare all the pictures and write the blog. I guess I’d rather be out walking than sat at the computer :)! A cottage is defined as a small and simple dwelling, often with a thatched roof. They are often associated with farms, being used to house farm workers in the past. The rooms are actually often small and I think the only reason some cottages look big is because they were probably a row of terraced cottages that have at some time been converted to one single dwelling. What I find strange is that when cottages were built, they housed the poorer people whilst the rich lived in the towns, but now it is the other way round. Enjoyed reading your blog Terry. 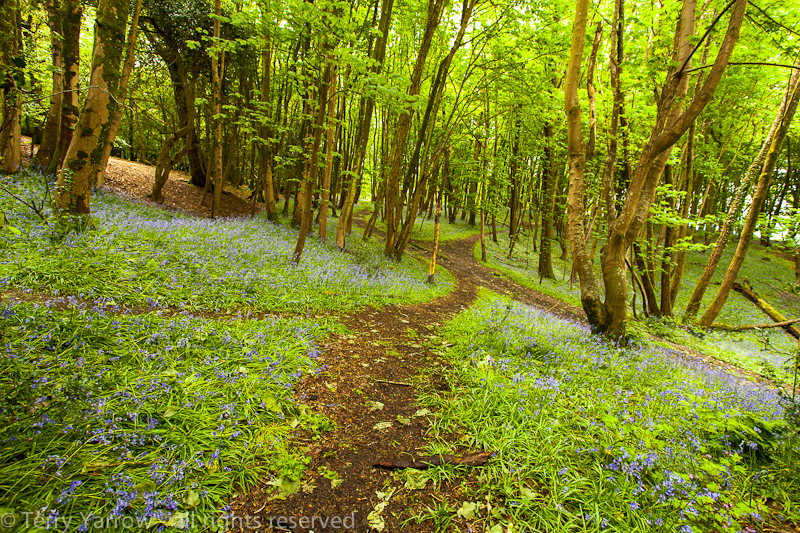 Lovely pictures, love the orchard with the bluebells and the riverside walk with the cow parsley. Thanks themodernsportinglife 🙂 It is a lovely county to live in. What a wonderful walk and narration. I’m impressed by your knowledge of Hardy. I’m even more impressed by your exposures in the churches though. They are spot on. It’s the sort of walk I’d love to do with my camera but which is normally impossible with 2 dogs in tow. Thanks Julia, you are very kind 🙂 The Winterbourne Came church is very dark so I was pleased that picture came out ok. It is a lovely walk.